I built these bogies a few years but due to a change in direction they are now up for sale. At this moment in time the bogies are with me in Germany but I could bring them back to Milton Keynes at Christmas. The flat plate on top is a thrust ball table with if I remember correctly has a 800 kg max loading, this rotates and fixes to the under side of your coach or truck. The wheels are connected together with a tube. there is a sealed ball bearing in each wheel. A 20mm Dia axle runs through the tube and is carried in the rubber suspended axle blocks both sides. this axle does not rotate but it holds the side frames at the correct distance apart. 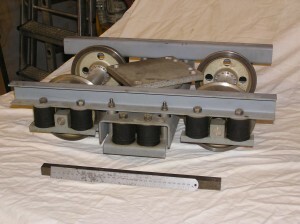 the bolster presses on four 50 mm rubbers on both sides, the bottom of these rubbers is connected to the side frames. This gives a very flexible bogie without risk of bearing misalignment. £400 is for the pair. If you require any more information please use any of the contact details below.